‘R.o.W. With Butch’ is a weekly column about tech outside Silicon Valley, in the Rest Of the World. This week it comes from Sarajevo, Bosnia. At the height of the Bosnian War between 1992 and 1995, some 8,000 grenades a day would rain down on the capital city of Sarajevo, while snipers plied their deadly trade from the hills above the city. The internecine warfare between Bosnia’s different nationalities, religions and ethnic groups – a result of the breakup of communist Yugoslavia – was total, and remains one of the great tragedies of the 20th century. Driving from Sarajevo airport into town, passing tall Soviet-era tower blocks, you can still see the bullet holes covering many buildings, forming large clusters near the tops of the buildings where more snipers would hole-up. But after years of tough economic times, the city, the country and its resilient people are looking to the future. Last weekend saw signs of a new cluster emerge on the European and global tech scene – that of the Sarajevo tech cluster. But as has happened in many other Central and Eastern European countries before them, the tech scene in BH is gradually changing, as new entrepreneurs emerge and traditional outsourcing companies realise they too can start to produce their own startup products. #SarajevoFTW has been amongst the first events in the city to begin to galvanise the tech startup scene there, (preceded only by the Balkan Venture Forum in the city, a day before). It certainly was not the easiest of timings. After uncharacteristic, torrential rain, Bosnia, Croatia and Serbia have all suffered from the worst flooding in 120 years (see below). Organized by USAID, regional tech news siteNetokracija, and Teres Capital, the #SarajevoFTW event brought together key players from Bosnia Herzegovina to connect startups with investors and investors with each other. A pitch competition run by European-wide accelerator Startup Bootcamp saw very early stage startups pitch to a crowd of brand new Angel investors, mentors and others. In the end the pitches were one by LiveGood, YuTransfer and Light Docs (yet to launch), a startup started by two 16 year olds – an unheard of result a few years ago, and testament to the explosion of technology around the world. But it quickly became clear that the key lynchpins in this new ecosystem are two men named Edin. 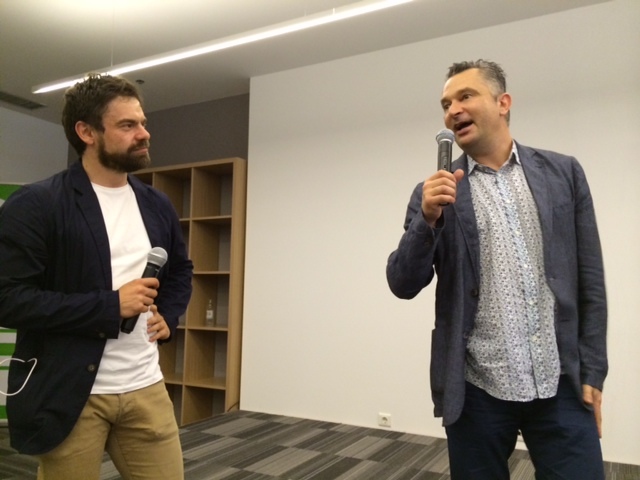 Edin Mehic (left, above), CEO, of Posao.ba and Edin Saracevic (right, above), founder, HUB387 and Nest71. Saracevic decided to double-down on the potential of the city and the country to produce new companies, after exiting his own startup. Founr months ago, Saracevic, a serial entrepreneur, found a disused shopping mall which had lain empty for 12 years and converted two floors into a co-working space (Nest71) and a General Assembly-style educational facility, Academy387 based at HUB387. Why all the 387s? Because in a multi-ethnic country, it’s much easier to refer to the countries’ area code of 387 than it is to refer to a place or region. Saracevic hopes to help educate the next generation of engineers and entrepreneurs in Sarajevo. He also plans to build a fund four startups in the next 18 months. “Today everyone can dream – everything is possible,” he told me. Max Gurvits, Partner with Teres Capital (a new fund based out of Sofia, Bulgaria), says while the tech scene is still ‘early’, he’s confident a range of new tech startups will emerge from the wider South Eastern Europe region, of which Bosnia is a part. For his part, Mehic, who created the new accelerator called Bizoo, says Sarajevo has some advantages in the Balkans region. 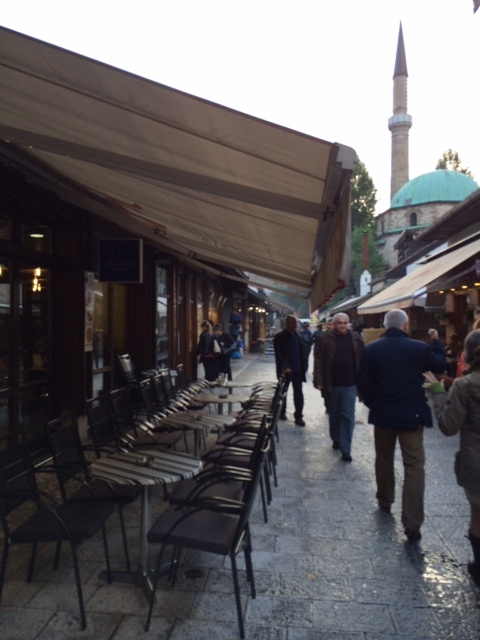 While Belgrade is the biggest city in the former Yugoslavia, some companies are using Sarajevo as a hub for the region due to its lower costs and relatively neutral location. His own story reflects the journey of the country, and its tech scene. During the Civil War his parents were concerned about his education, so sent him and his sister to Croatia where he had to make ends meet and look after his younger sister. He returned age 19 and went to university. From there he was responsible for putting Sarajevo back on the Internet via a satellite link to Amsterdam to the internet, all on Windows 95. One day he was in the computer lab at the university and a professor came in. “He said he wanted us to develop software for the UN.” Thus, Mehic helped develop the first country-wide software system to track displaced people as a result of the war. More recently Mehic has exited a regional job listings board (bought by the UK’s Daily Mail group) and started salary survey site, also acquired by a Finnish group. He now concentrates on developing Bizoo and the local ecosystem. Thus, where once grenades and mortars fell, a converted shopping mall played host to a tiny new startup winning a pitch competition. Sarajevo, once a city synonymous with war, finally has a brighter future, and hopefully tech entrepreneurship will play its part. The Balkan countries have been devastated by floods. If you would like to donate to relief efforts, one charity to consider is the appeals set up by Red Cross in the US, or the Red Cross in the UK. Below you will find more info.